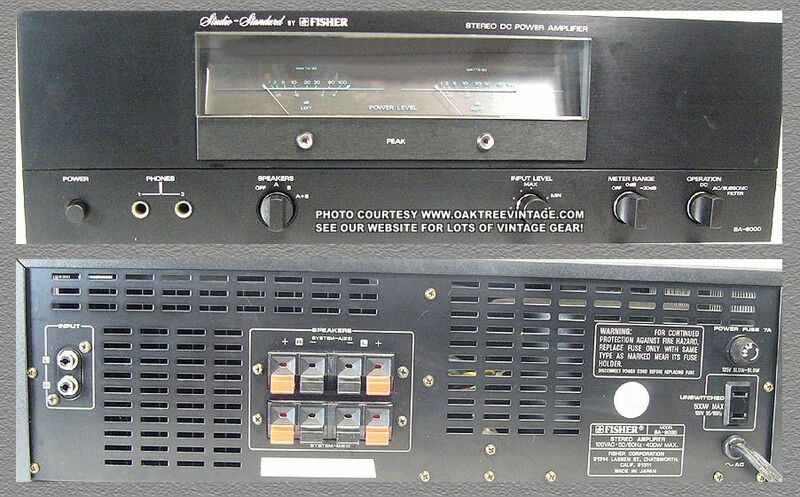 Fisher Stereo Parts & Spares for Fisher Stereo Power Amplifiers; BA-6000, CP-7000, Fisher Stereo Receivers RS-2003 & RS-2010. 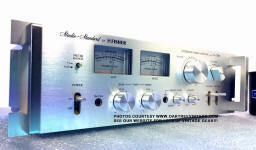 Fisher vintage stereo parts for reference information, specifications / specs info and occasionally for sale. Most of unit was sold as a movie prop. We have a few of the internal parts as listed below. Tuning capacitor string wheel - $35. Circuit Board, �Phono Pre-Amp� Circuit board #FRC P1389-A with transistors; BC109, TR2924-18, with balance of capacitors, resistors - $45. Circuit Board, Tuning Capacitor ( 6-gang, on PR114 circuit board) - $35. Capacitors, Power supply filter Caps 2500 mF & 75 WV - $22.50 ea. Capacitors, Power supply filter Caps 1200 mF & 65 WV - $18.50 ea. Transistors, Power Amplifier Output Transistors, RCA TR1007 / FO 67508D, TO-3 transistors - $20. ea. Heat Sinks (less outputs) - $20 ea. 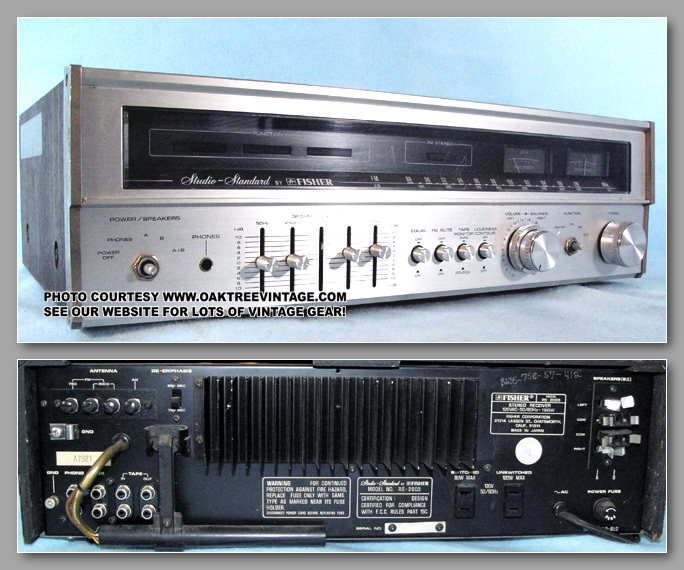 Some parts MAY also fit other FISHER POWER AMPLIFIERS but we have no definitive info. Panel, Black Face panel with glass and power level meters. Good condition - $35. LED, �Peak� LED indicator on circuit board #4 2262 050710 - $20. LED, �Peak� LED indicator on circuit board #4 2262 050810 - $20. Knob / Cap / Button / Cover, �Operation�, �Meter Level� or �Speakers� Knob - $25. Knob / Cap / Button / Cover, �Input� level knob - $25. Knob / Cap / Button / Cover, Round �Power� push cap - $20. ea. Switches / Selectors, Alps 'Power� Push switch with clamping capacitor, ALPS Snap P-028 - $30. Switches / Selectors, Alps �Meter Range� switch / selector - $25. Switches / Selectors, Alps �Operation� switch / selector - $25. Switches / Selectors, Alps �Speaker� switch / selector on Circuit Board #4 2262 0505 10 - $35. Potentiometers / Controls, Input Pot Alps 201520 100kBx2 - $30. Power Transformer, Bando 4-2512-10100, BE 71b-0004 �Shielded� Power Transformer - $45. Power Capacitors, Power supply filter Caps �Rubycon� CE62W 1500uf 67V, with mounting bracket - $35. ea. Relay, Omron Type LY2-0-JT - $35. 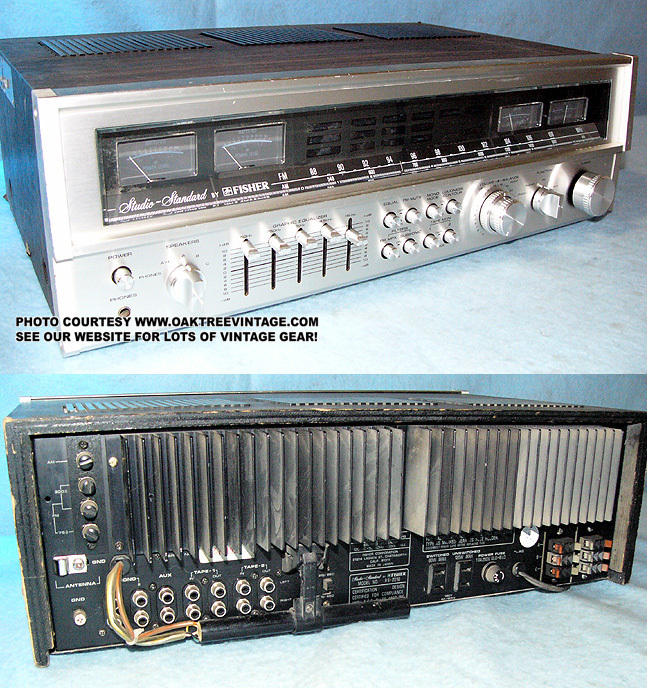 Transistors / Outputs / Power Amp, Output Power Pack, Original STK 0100 II, Good condition - $35. ea. Heat Sinks, Original (2) - $20. ea. Circuit Board, Rectifier Circuit board #4 2262 050610 with 2x 100v / 1000mf capacitors, & Bridge Rectifier. $35. Jacks / Terminals / Connectors, Speaker Output Clips / 2 banks - $35. ea. Jacks, Headphone jacks - $25. ea. Jacks / Connectors, Input pair RCA jacks - $20. Jacks / Connectors, AC Convenience Outlet - $20. ea. Fuse holder, Fuse holder, less fuse cap (cap sold separately) - $20. Fuse Cap, Fuse cap (holder sold separately) - $30. Panel / Plate, Rear sheet metal panel, less components � $25. Panel / Plate, Bottom plate sheet metal - $20. Some parts MAY also fit other FISHER POWER AMPLFIERS but we have no definitive info. Panel, power level �meter surround / bezel �, black sheet metal, one piece, silk screened RIGHT / LEFT (meters sold separately) - $25. Switches / Selectors, 'Power� toggle switch, 24382 AX - $30. Switches / Selectors, �Meter Range� rotary switch / selector - $35. Switches / Selectors, �Voltage adjustment� switch Alps slide switch - $25. Power Transformer, Power Transformer, �Multi-Voltage� / �World AC Power� adjustable 120v-240v power option 4-2512-02920 YODA 8N-01(switch sold separately) - $65. Power Capacitors, Power supply �multi-element� filter cap Rubycon 2X 6800uf 50V, with mounting bracket - $35. Rectifier, �Bridge� S5VB - $20. 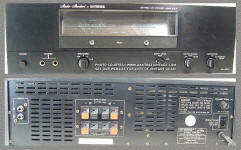 Outputs / Power Amp, Output Power Packs / chips Sanyo SS1001, Good condition - $45. ea. Heat Sink, Original (less output transistors) - $25. Circuit Board, �Amplifier� Circuit board #4 2269300200 with transistors; 2SA659, 2SC536, 2SC1175 with balance of capacitors, resistors, (less output power packs and heat sink, less R14, R13 SOLD) - $35. Circuit Board, �Meter Range� Circuit Board #4-2262-00560 (less selector switch) - $35. Jacks / Terminals / Connectors, Speaker Output Clips / 2 banks - SOLD. Jacks, �Headphone� jack �� - $25. Jacks / Connectors, �Input� pair RCA jacks - $20. Fuse holder, Fuse holders, chassis mount, (three) - $15. ea. 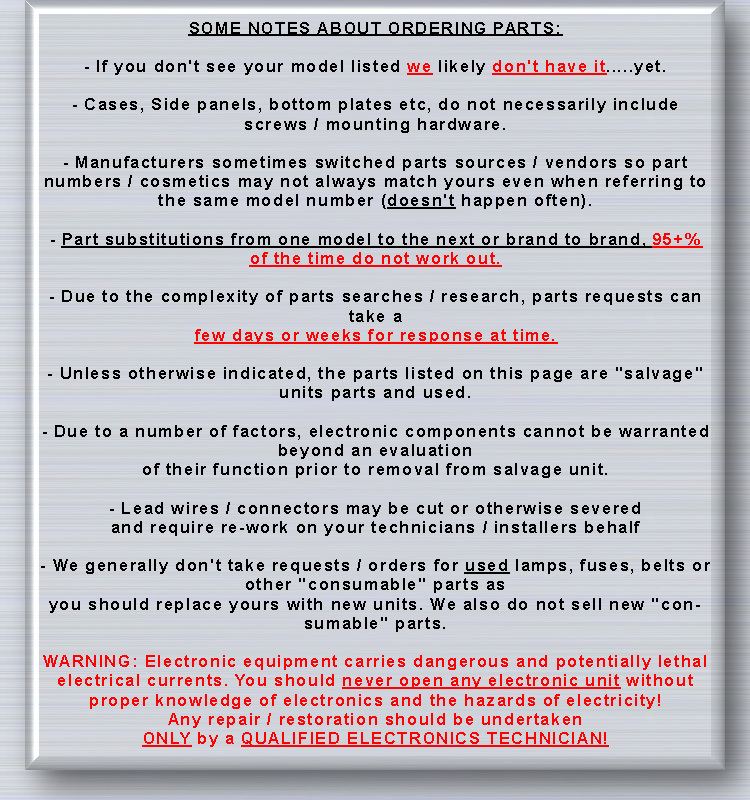 Panel / Plate, �Rear� sheet metal (less any components, jacks, connectors, switches) - $20. AC cord, European style plug- $20. Unit powers up, but 'right' side output issues. Squared wave bottoms. X-Over distortion. Unit VERY good cosmetically. Face, case, rear panel and face in great condition. Knobs all look new. Front / Face panel, clean with dial window / glass (minor scratches on dial glass / window) (less end caps) - $45. Caps, Left (facing) or Starboard Face plate end cap. Light surface corrosion - $20. Caps, Right (facing) or Port Face plate end cap. Light surface corrosion - $20. Panel, Dial light / lamp �diffusion panel�, clear plastic. (grey rubber lamp sockets sold separately) - $25. 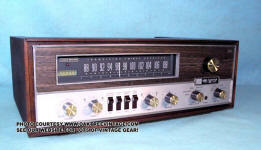 Panel, Tuning �Dial lamp / bulb housing, w/ lamps / bulb holders (Tape lamp bulb - $30. 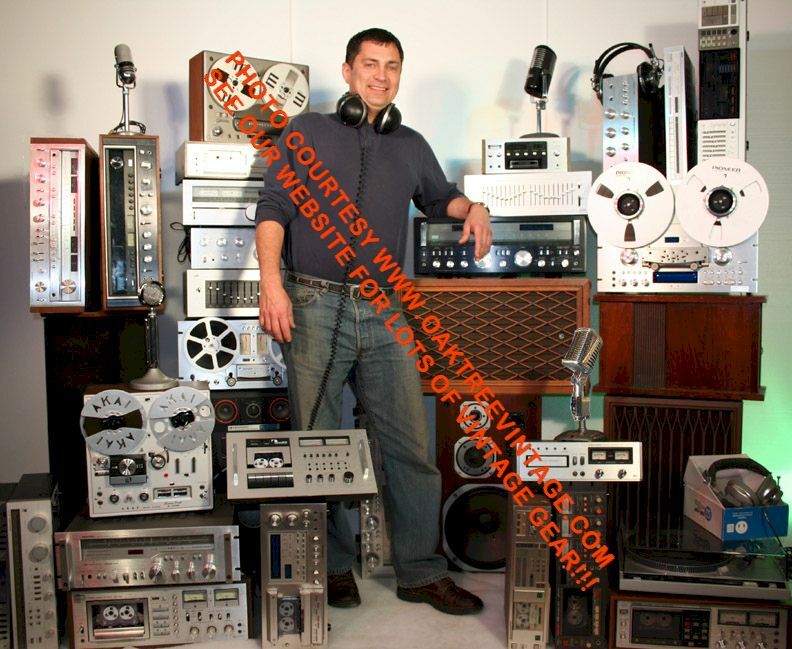 Display, �Tuning� scale, black anodized aluminum with function display colored panels (bulbs not included), for Phono, Tuner, Tape and meter cutouts - $35. Display, Clear plastic back light - $25. Sockets, Gray rubber dial / meter lamp / bulb sockets / holders - $15. ea. Tuning Wheel, �Tuning pulley� plastic string wheel - $35. Flywheel, �Dial Flywheel� / Tuning control - $30. Meters, Analog �Signal strength' meter - $35. 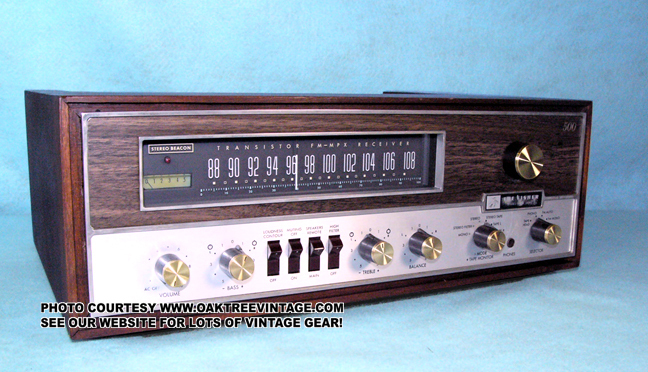 Meter, Analog �Center of Channel� meter - $35. Pointer, Dial Pointer / indicator - $25. Knob / Cap / Button / Cover, �Tuning� knob - $25. Knob / Cap / Button / Cover, �Volume� / �Balance� 2 piece knob - $30. Knob / Cap / Button / Cover, �Power�, �Equalizer�, �FM Mute�, �Tape Monitor�. �Loudness� push switch button caps - $15. ea. Knob / Cap / Button / Cover, �Equalizer� slide control knobs - $15. ea. Potentiometer / Control, �Volume / Balance� control pot, ALPS #200140 100k- 250k X2 Audio Taper (knobs sold separately) - $40. Switches / Selectors, �Function� rotary wafer switch w/ castle nut - $35. Switches / Selectors, �Equal�, FM Mute�, �Tape Monitor�, �Loudness Contour� push switches (less button / caps sold separately, less circuit board) - $25. ea. Switches / Selectors, �FM de-emphasis�, slide switch (less rear panel) - $25. Transformer, Power supply Transformer 180603 / 4-2512-07000 � YODA-A / 95-2 - $55. Capacitors, Power supply filter Cap, Multi-element, Rubycon 2x 50V 4700 mf - $20. Capacitor, �Tuning� capacitor 5-gang (less circuit board) - $35. Circuit Boards, �Power amp� circuit board, 4-2262-01240 / GCMK-45EY, with transistors; 2SA659, 2SA798, 2SB560, 2SC1175, 2SC1570, 2SC1571, 2SC1708, 2SD438 (output transistors, heat sink sold separately) with balance of capacitors, resistors - $45. Circuit Boards, �Tuning� circuit board TKEF394V-1 / 42262-01200 with transistors: Hitachi 2SC461, 2SC535, 2SC536, 2SC930, 2SC1570, IC Chips; Sanyo LA1230, LA1240 & Hitachi HA11223W with balance of resistors, diodes, capacitors (less tuning capacitor) - $45. Circuit Boards, �Control� circuit board, 4-2262-01210 with transistors; 2SC732, 2SC1570, IC JRC4558DX (less controls / pots / switches) - $45. Circuit Boards, �Power supply� / Rectifier circuit board 4-2262-01251 with transistors / Voltage Regulators; 2SD330, Sanyo 2SB514, Full-Wave / Bridge rectifier S4VB, fuse clips and balance of resistors and capacitors - $45. Transistors / Output, Darlington Power Pack STK-0040 output transistor, 1 only (less circuit board, transistors, capacitors and heat sink sold separately) - $45. Fuse cap, Screw-in fuse �cap� (less fuse holder, sold separately) - $35. Fuse Holder, �Holder� with attached resistor (less cap, sold separately) - $25. Jacks / Terminals / Connectors, RCA �Phono �, �Aux�, �Tape In / Out� input jacks sold in molded blocks of 2 pairs - $25. ea. Jacks, Headphone jack - $25. Jacks / Terminals. �Antenna� binding post section (less rear sheet metal panel) - $25. Jacks / Terminals / Connectors, AC �Convenience� outlets (less rear sheet metal panel) - $20. ea. Antenna, AM antenna / Stick / Ferrite Antenna (less mounting bracket, sold separately) - $30. Bracket, AM antenna bracket / hinge that bolts to rear panel (less antenna, sold separately) - $25. Bracket, AM antenna linkage between antenna and �hinge bracket� (less antenna, sold separately) - $25. Panel / Plate, �Rear� sheet metal, (less any plugs, adapters, switches, antenna, input / output jacks / terminals) - $25. Feet, feet - $20. Set 4 feet or $12. ea. 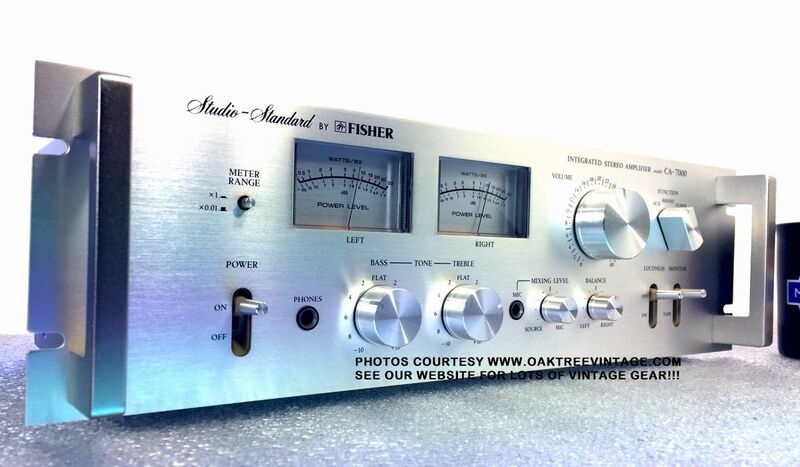 Many of the parts such as controls, pots, switches and knobs MAY* also fit other Fisher models. Power Output Device, STK-0040 - Reference info ONLY. Not currently available from this menu. Transformer, Power transformer #18604 - Reference info ONLY. Not currently available from this menu. Capacitors, Filter Capacitors, 50 Volts / 6,800 uf - Reference info ONLY. Not currently available from this menu. Unit powers up, but output relay does not kick on and no output. Unit VERY good cosmetically. Face, case, rear panel and face in great condition. Knobs all look new. Face panel, with glass (less knobs / buttons) (light marks, but still looks decent) - see lower photos, above}- $69. End Caps, Cast aluminum Face panel end caps (left side BADLY scuffed. Right side minor 'dings') - $15. ea. as is. Knob / Cap / Button / Cover, Tuning knob - $25. Knob / Cap / Button / Cover, Volume knob - $25. Knob / Cap / Button / Cover, Round Push button caps - $15 ea. Knob / Cap / Button / Cover, Graphic Equalizer sliders - $20. ea. Switch / Selector, Power switch ALPS TV-5 SDV1P 'Push' switch - $25. Switch / Selector, Function Selector ALPS 049 type (not all the same) - $35. Switch / Selector, Speaker selector ALPS 049 type (not all the same) - $35. Switch / Selector, Any switch (not already priced separately) - $25. ea. Dial, Dial Scale with source indicator lenses - $30. Capacitors, Tuning Capacitor ( 6-gang, on PR114 circuit board) - $35. Wheel, Tuning capacitor string wheel - $35. Transformer, Power supply Transformer 210204 / 4-2512-04509 / YODA-A - $55. Capacitors, Power supply filter Caps NIPPON CHEMI-CON 15,000 mF & 67 WV - $20. ea. Rectifier, Full Wave Bridge Rectifier S15VB - $25. Circuit Board, Power Supply / Protection-Relay Circuit board 4-2262-01401 with transistors / Voltage Regulators; 2SB560, Sanyo 2SB514, 2SC536, 2SC1175, 2SD330, 2SD438, and balance of resistors and capacitors (less relay) - $45. Circuit Board, 'Tuner' Circuit board w/ chips; Sanyo LA1222, LA1230, LA1240, & Hitachi HA11223W - $35. Circuit Board, 4-2262-01340 w/ chips; Hitachi HA1457W - $25. Circuit Board, Any single circuit board unless priced separately already (less pots, switches, relays, large transformers, outputs) (less pots, switches, relays, large transformers, outputs) - $35. Heat Sinks (less outputs) - $25 ea. Jacks, Phones Jack - $25. Jacks, AC Convenience Outlets / jacks - $15. ea. Fuse Cap, Insert ONLY - $20. Feet, Set 4 feet - $25.